6082 aluminum mould plate refers to heat treatment aluminum alloy with high strength, good machinery as well as weld ability. For some special mould, it also required corrosion resistance and oxidation resistance.6082 aluminum mould plate is a special extrusion alloy with minor elements of Al-Mg-Si.at present, 70% persentof aluminum alloy extrusion aluminum products are made by 6000 series aluminum plate. 6082 aluminum mould plate can be mainly divided into 2 tempers, o and T temper, and the former means annealed temper used mostly low strength required products. The later refers to heat treatment temper that for high strength products. For molding plate 6082 H12, the first number “1” refers to work hardening, the number “2” refers to tensile strength. 6082 aluminum mould plate keeps higher weldbility and good formability, which is easy to bend and formed into different components parts. 6082 T5 and 6082 T6 is an ideal alloy for high machinery required mould. Most of 6082 aluminum mould plate is also thick plate, which is widely used in machinery parts, vehicle body, rail way parts and shipbuilding. 6082 aluminum mould plate can be applied in various mould industries. 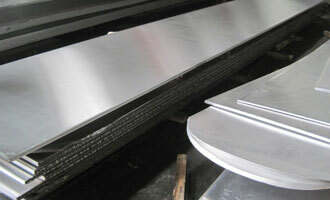 As the raw material of car body and components parts, aluminum plate show excellent performance than other metals. In construction, aluminum plate can be used as decorative wall, corrosion resistance plate, it also can be deep produced for ship board, electric vehicles and others. There are many good characteristics can be found in 6082 aluminum mould plate, it is easy to be processed and electroplated. The metal is durable and free of deformation. On defect can be found on the surface of 6082 aluminum plate. It can also used in high end products like tank car.